Through years of research and refinement, Dr. 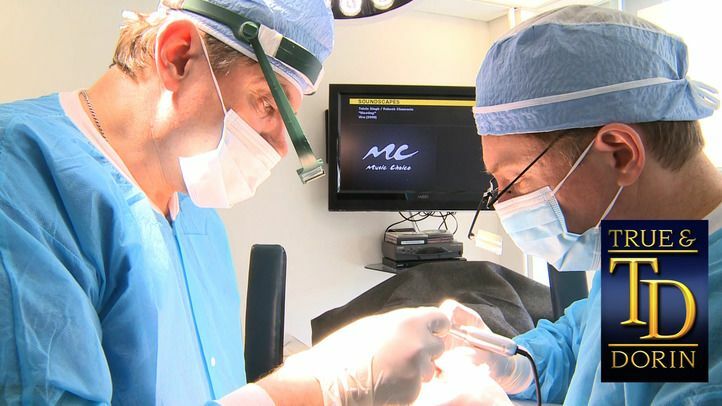 True and Dr. Dorin employ a method of donor site harvesting that is far superior to older techniques, and is designed to minimize and conceal any sign of scarring. Depicted in pictures below are FUE and FUT cases. 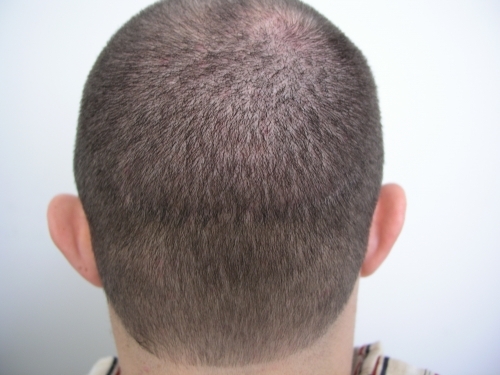 Minimally invasive Hair Transplantation with follicle extraction (FUE) produces more diffuse tiny circular scars in the donor area. 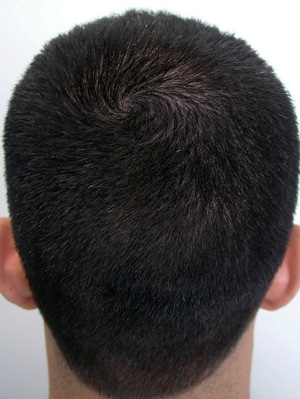 The chief advantage of this harvesting method is that the donor area hair may be worn shaved close to the scalp after a transplant. 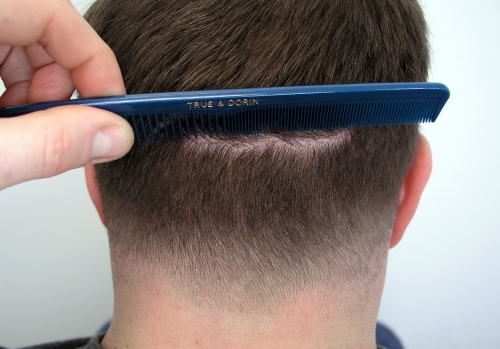 In our FUT strip harvesting method, a single strip of donor scalp is removed, and the remaining open donor area is meticulously sutured closed using a two-layer technique that consistently results in a small, linear scar. 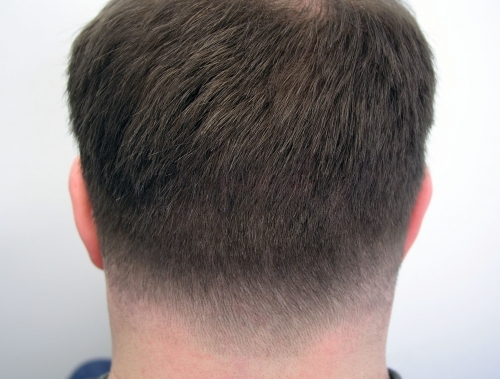 When we are doing a repair case in which we are re-harvesting an old scarred area there may be a somewhat larger scar, but it can still be hidden under the remaining hair. The new methods of harvesting make more efficient use of the donor area. In punch grafts, a certain amount of tissue is wasted around each circular graft. 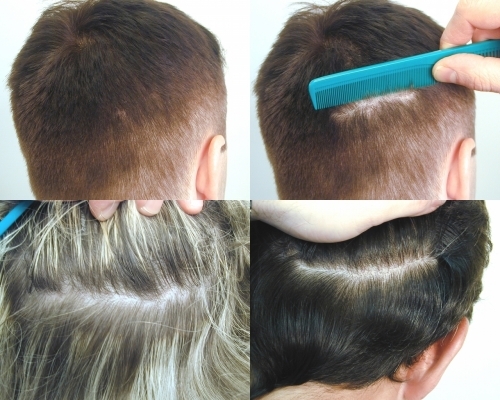 With the use of the FUT strip harvesting method, we are able to utilize all of the donor hair, which makes possible the ability to transplant the entire bald area. 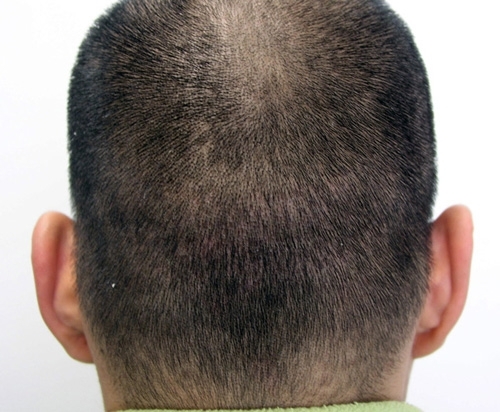 Even patients who have had multiple treatments will have just one fine linear scar in their donor area, which is easily concealed under hair worn ½ inch or longer. If a series of treatments is required, our approach is to remove all scar from previous treatment in the selected donor area as part of the new strip. 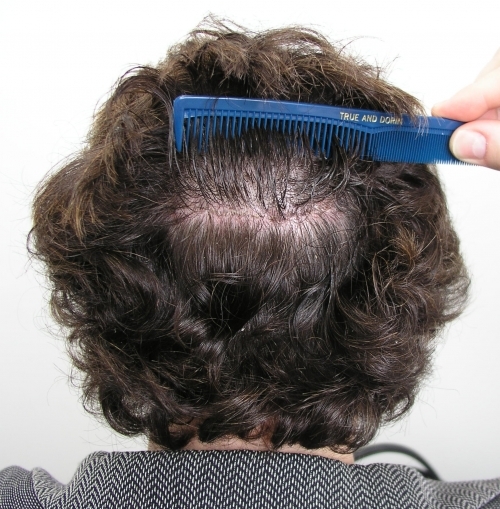 Thus, even for patients who have had extensive harvesting of their donor and/or who have had multiple treatments will have just one fine linear scar in their donor area that is easily concealed under hair worn ½ inch or longer. If you would like to ask us more questions about what to expect from the procedure, how the scar will look, or if you would like to schedule a consultation, please send us a message or contact us at (866) 629-0866.